Just two days ago I decried the relative lack of innovation in mobile gaming, and after climbing EPOCH's surprisingly steep difficulty curve, I get to eat humble pie. 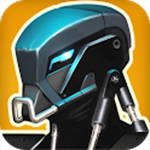 This cover-based shooter from Android newcomer Uppercut Games blew me away with its original control scheme and immersive graphics. It's not flawless, but its combination of mobile-friendly gameplay and and impressive presentation should make every action gamer (and developer) sit up and take notice. The shooting is fast and twitchy. The battle system requires skill, timing, and strategy to master. 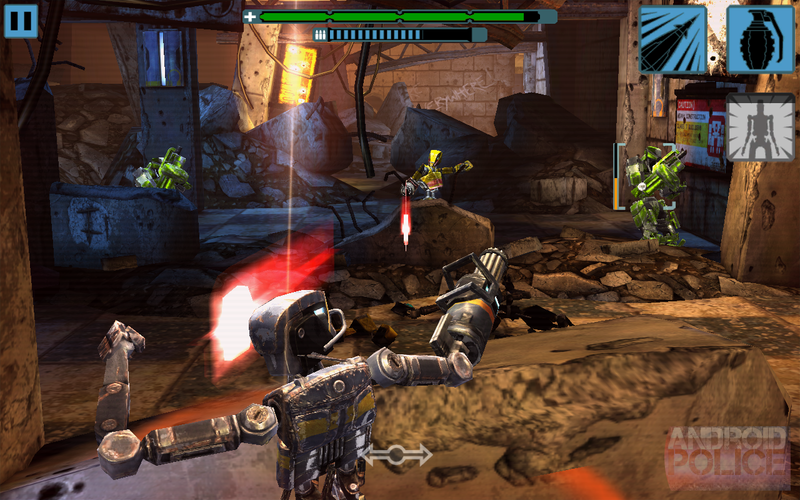 And best of all, EPOCH is a triple-A action game that never once had me wishing for my controller. While the gameplay can get repetitive (especially if you don't take the time to experiment with new weapons and builds) and the story and setting are mere filler, EPOCH deserves a spot at, or at least near, the top of the Play Store sales charts. 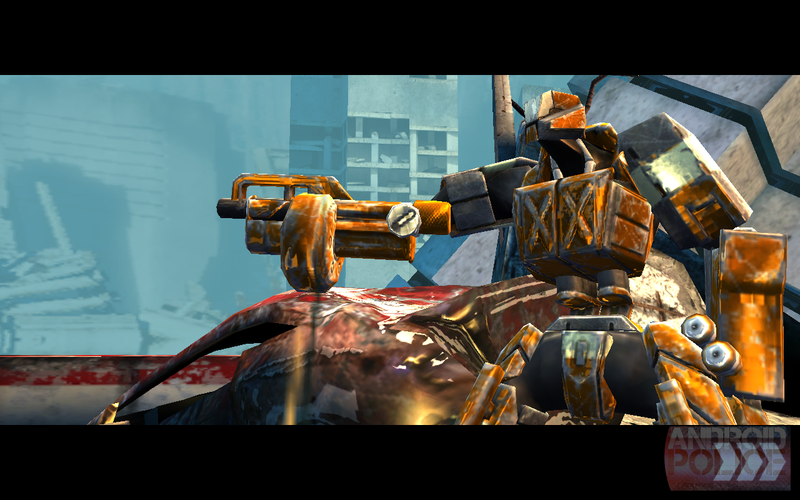 In EPOCH, you play a lone robot tramping through an apocalyptic wasteland, beset on all sides by similar machines. Imagine the Terminator universe if the machines won, then started beating up each other out of boredom. Your avatar is journeying to find what might be the very last outpost of living humans and protect them, but to get there, he'll have to defeat waves and waves of antagonistic androids, stealing their parts and abilities along the way. He's basically what Mega Man would be if he were made out of leftover gas tanks. The story and setting of EPOCH are, frankly, dull, not living up to expectations given the ambitious title. 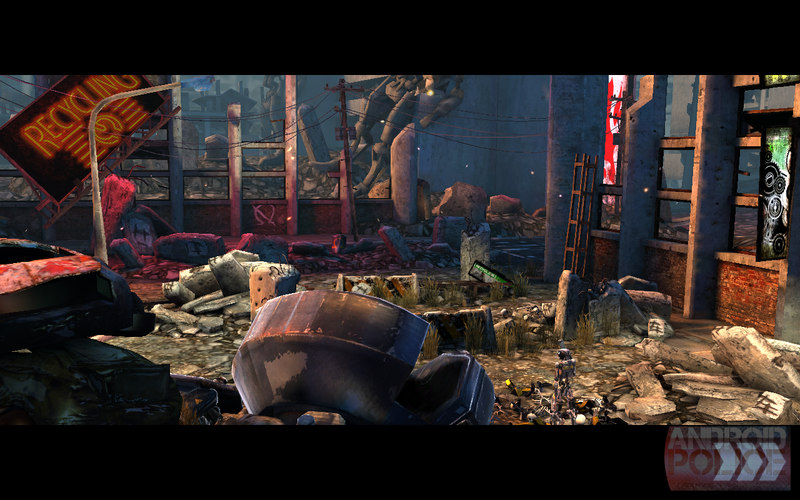 The Unreal-powered graphics are excellent, and it's clear that at least some effort was put into crafting a narrative. But it's hard to care about characters whose only presence is textual messages, or a main character who's literally identical to most of the foes he faces. 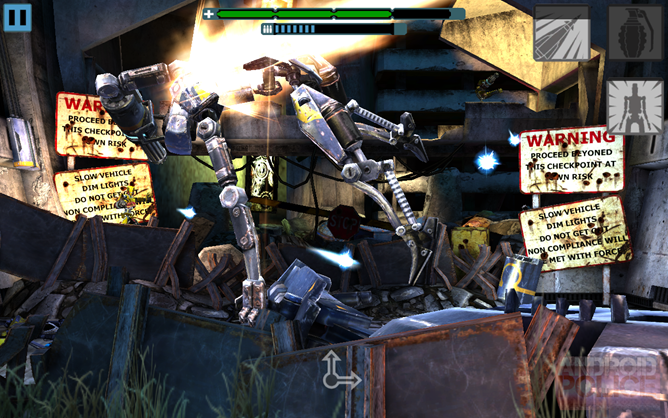 And the robots that attack constantly are, at least individually, about as threatening as Johnny 5. No, it's the gesture-based control setup and fluid battles that will keep you coming back for more. 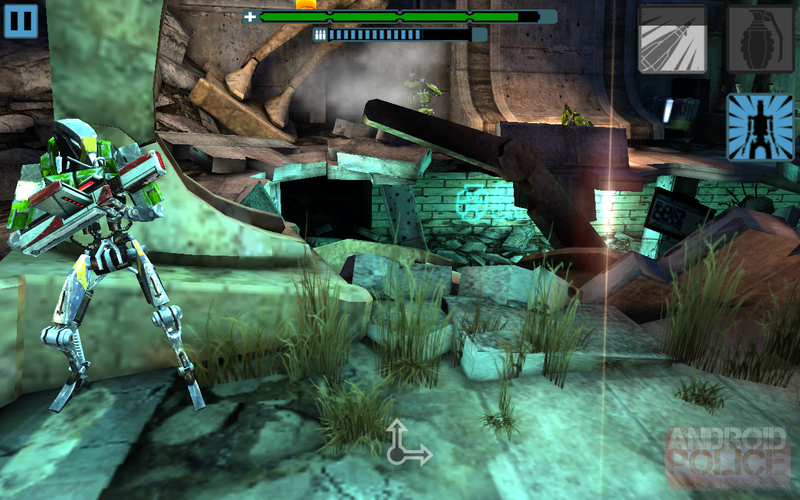 Gameplay progresses thusly: tap on an enemy to start shooting it. Swipe to either side to move between one of three cover positions, or swipe up to leap into the air to jump two cover slots at once. 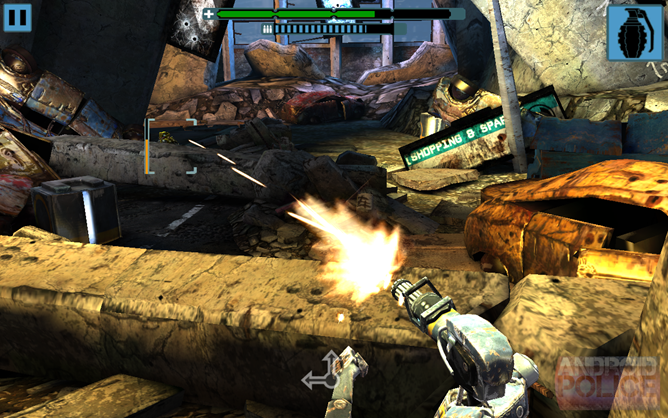 Swipe down to take cover, down again to manually reload, then swipe up once more to commence shooting. There's no aiming, beyond selecting opponents one at a time, and the only real variety comes from from three special moves: a grenade, a multi-targeting missile strike, and "overdrive" (slo-mo). All in all, it's surprisingly simple, adding up to little more than a pretty point-and-click shooting gallery. But in this case, the whole is literally more than the sum of its parts. During your first run through the admittedly short ten stages, you'll encounter something new in each level - a new, sneaky kind of enemy, an extra technique, or most often, a new part that your robot can use. 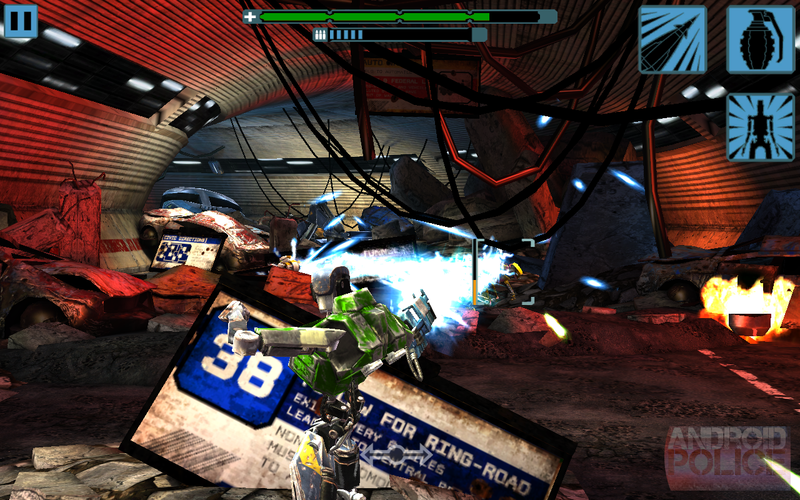 As he rips his opponents' modules off to add to his own, the robot avatar becomes more powerful and flexible. 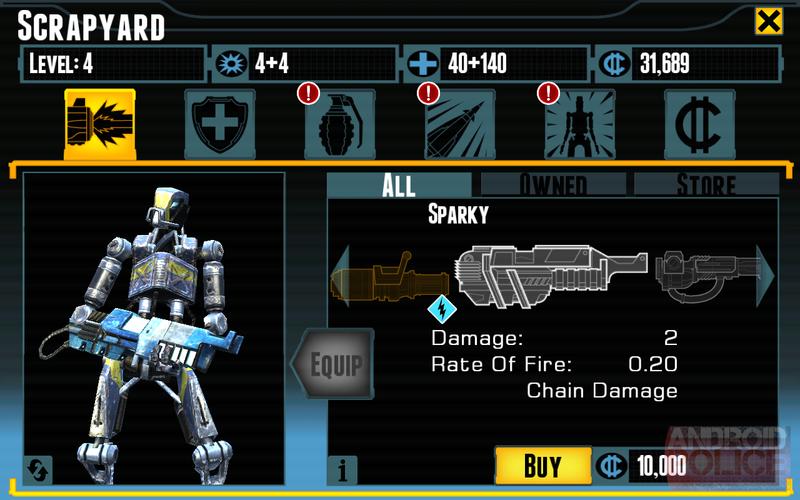 Almost every gun you encounter you can use, and you'll need to, to get past the increasingly difficult waves of baddies. 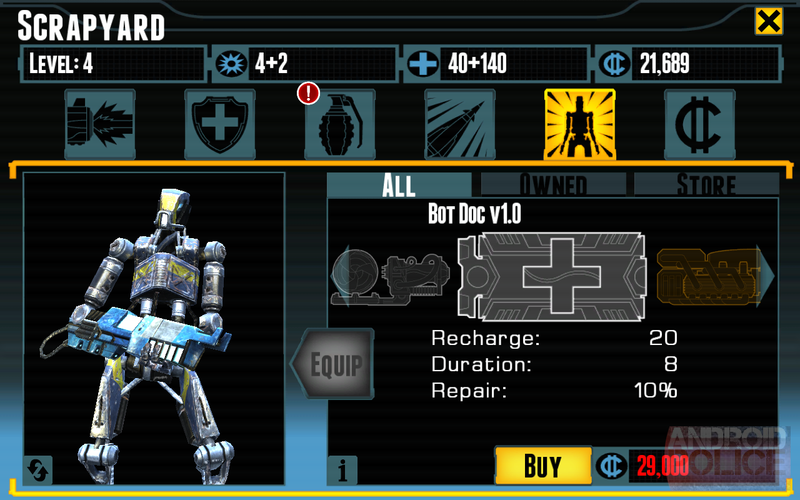 Weapons, chassis, armor, missiles, grenades, and overdrive can all be customized, and the variety therein is impressive. Want to be able to ignore the weaker gunners while you focus on avoiding grenades and blasters? Beef up that armor and practice your timing. Need a quicker way to take out the sniper/cutter robots? Find a gun that has a faster, tighter fire rate. In fact, "tight" is an adjective that fits EPOCH to a T: Whenever you find yourself stuck, there's some combination of hardware and strategy that can see you through. The fun comes in finding it. Say those cutters are giving you a particularly hard time. 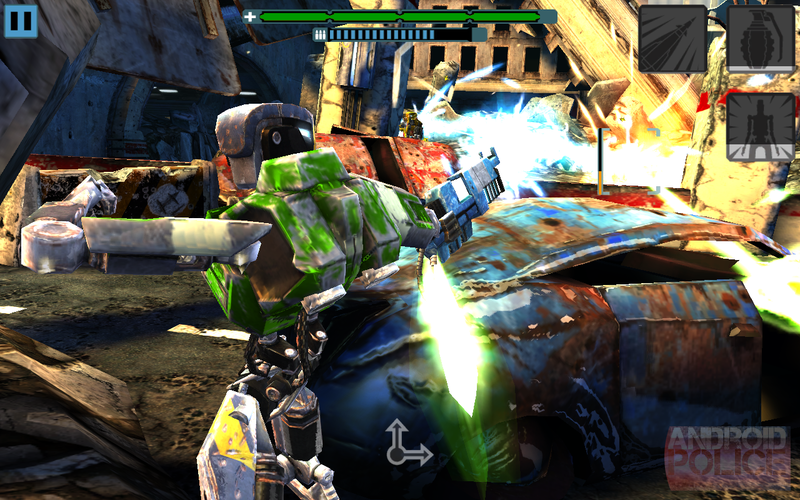 Switch to a static-based gun and identify the ones that have been grouped with weaker targets. 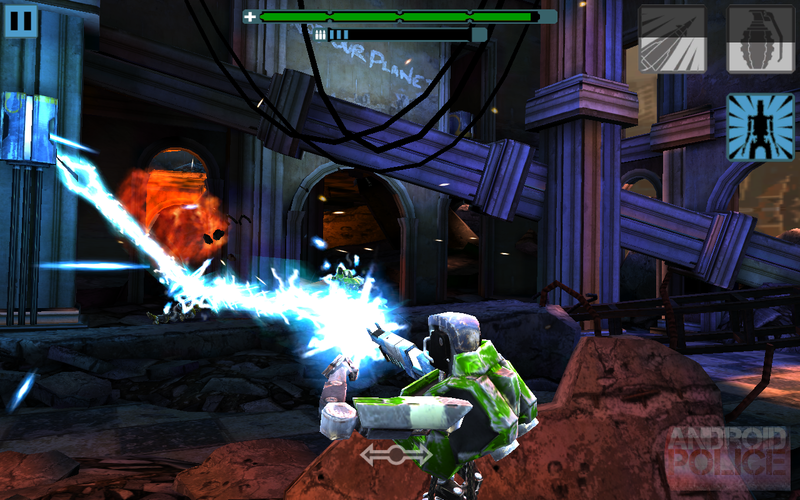 Focus your fire on the cutters, and the clingy lightning bolts will gradually wear down their fellows, allowing you to concentrate on the robot gymnastics necessary to escape the cover-penetrating beams. 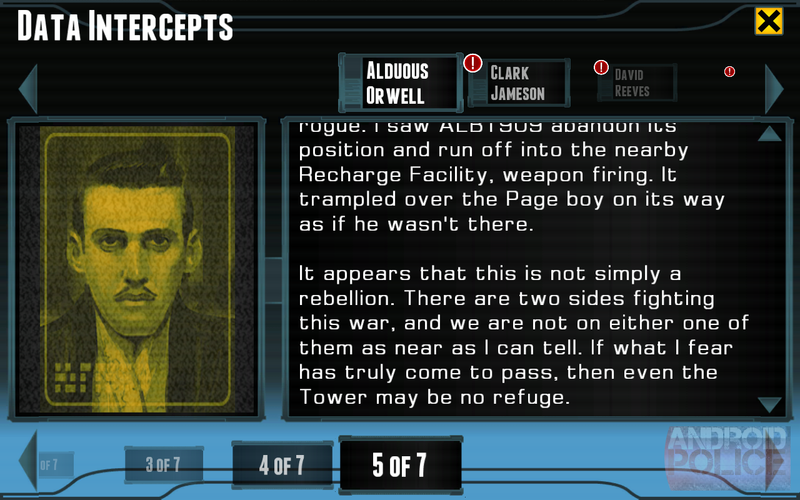 Clean up the rest of the wave with grenades and rockets, and you get through the stage considerably less perforated. Ten levels and just one boss separate you from the end of the game - or at least, the first end. Once you've beaten easy (the only difficulty level available at the start, and it gets plenty hard as you go along) you'll unlock three ever more punishing modes. 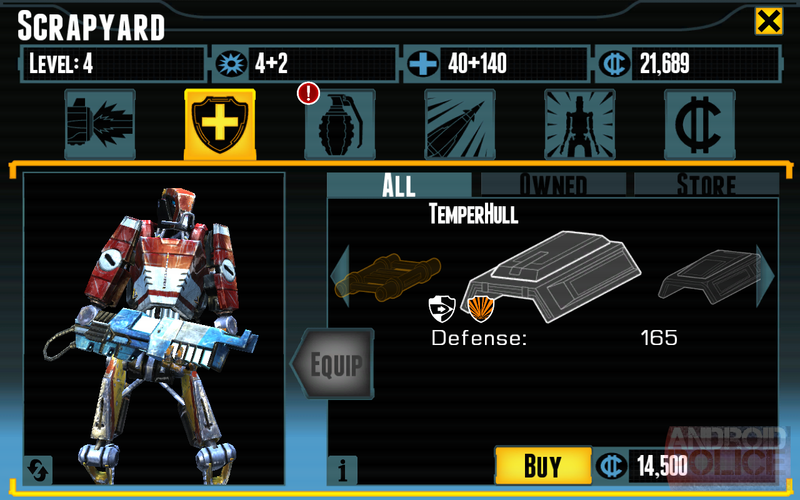 The enemies in these modes are tougher, but they also drop more coin for upgrades, allowing players to progress. This could certainly get dull after a while, and the only consolation is a never-ending horde mode. Multiplayer seems to have been swept away like the crumbling buildings. The presentation in EPOCH is a bit of a conundrum. Yes, the graphics are great, due in no small part to the Unreal engine. (The screenshots here are from the Nexus 7, and really don't do justice to the game's fluid action.) High polygon counts and impressive effects mean that you'll have some serious eye candy if your hardware can keep up. That said, there's a definite sameness about both the characters and the environments - you can only marvel at the detail and lighting on so many burned-out cars and crumbling concrete blocks before your eyes glaze over. The design of the stages themselves is in constant flux, but the actual look has a suggestion of clone stamp. Sound, on the other hand, is solid through and through. I'll grant that it's mostly electronic beeps set to action movie music, but the developers have done an excellent job in marrying the audio to the gameplay. 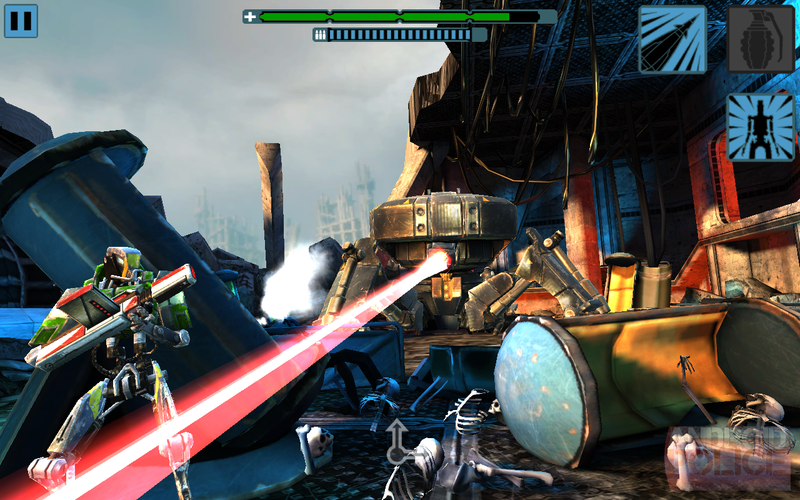 Enemy robots and weapons are distinct, and learning the subtle audio cues of the differing threats will give much aid to dedicated gamers. This is one of those games where you feel crippled if you're forced to play on mute... in a good way. Here's where the other steel foot drops: EPOCH has a currency-based in-app purchase system. In fact, it's the very same system I harped on in the Gaming Fads editorial - you'll have to unlock new hardware with money earned on performance. You can buy extra currency with real money, which might not be quite so jarring if EPOCH hadn't launched at a $4.99 price point, straying towards the more expensive side of the Android field. 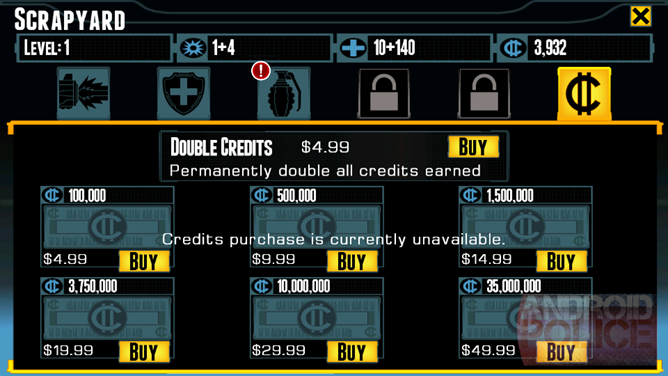 A high price and IAPs reeks of someone having their revenue cake and eating it too. That being said, Uppercut Games seems to be in an all-too-small minority among mobile developers, as they've exercised restraint when implementing this system. Even as I progressed towards the latter half of the game, I never felt cheated by a lack of funds - there was always some new hardware that was within reasonable reach, making the next levels accessible with better weapons, armor, or strategy. It's similar to Jetpack Joyride or Pocket Fleet in that respect: the IAPs are present, but never unreasonably pushed, and it's more than possible to enjoyably finish the game without them. Two things help save EPOCH from the righteous indignation of cash-strapped gamers everywhere: one, the prices on in-app purchases are quite reasonable. The $5 option to double all in-game winnings seems like it might be all that's necessary to get some of the really extravagant gear. And two, the game dropped to a $.99 price point yesterday, and since the Play Store description doesn't actually mention a sale, there's at least some hope that it will stay there. 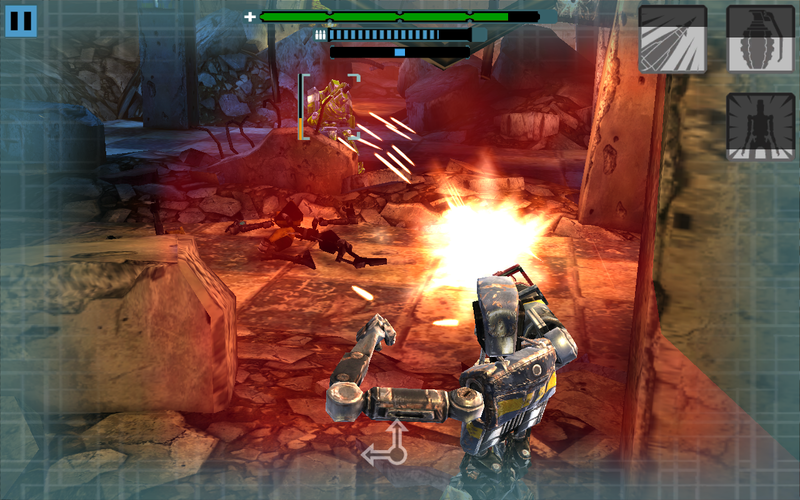 As far as controls, gameplay, and graphics go, EPOCH is very close to setting a new standard for mobile action games. If the enemies and environments were just a little more varied, it would surpass every game of its like in the Play Store. As it stands, it's an enjoyable, solid title that should be fun for anyone who's ever enjoyed Gears of War or Mass Effect, and wants to see that kind of shooter gameplay translated (and translated well) to touchscreens. There's still a fair bit of repetition and retread, but for those who dive into the customization system, this becomes an opportunity rather than a downside. The in-app purchases are a bit of a blow for a game that's so expensive (or at least was at launch), but they're handled with restraint and entirely optional. 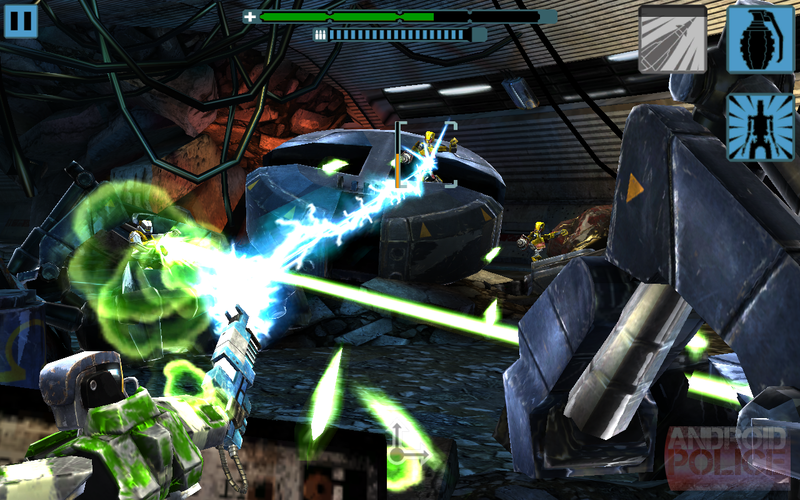 At $4.99, EPOCH is an easy buy for the action gamer looking for something fresh with high production values. At a single greenback, I can recommend it for just about everyone. EPOCH is a $.99 download at the time of writing, and available for devices running 2.3 and up.